I have just published my latest book Dismantling Tyranny: The Marc Lemire Case, which details the upcoming battle at the Federal Court of Canada over Canada’s shameful internet censorship legislation – Section 13 of the Canadian “Human Rights” Act. After a 6 year legal fight, in September 2009 I was the first person in the history of Canada to win a Section 13 case at the Canadian Human Rights Tribunal. The Tribunal found me innocent of allegedly “exposing” privileged minorities “to hatred and/or contempt” and found the law under which I was hauled before the Tribunal as unconstitutional under Canada’s laws. The fanatical censors at the CHRC – caring little about tax-payers money – appealed the Tribunal decision to the Federal Court of Canada, in a lame attempt to keep their censorship franchise afloat. 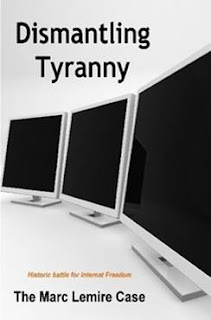 Dismantling Tyranny details exactly what is wrong with Section 13 and Internet censorship. It is a broad look at how the dirty side of censorship really works, from the suppression of freedom of speech (which the CHRC considers an “American concept”) to spying on Canadians. This 80 page book covers the facts of censorship from both a legal and moral position and is a must read for anyone that has been following the utter fall from grace these disgusting censors so richly deserve. Dismantling Tyranny is available in paperback and Ebook formats. You can order online from one of the mainstream book distributors like Amazon.com or Lulu.com or directly from me. If you want a copy of the book prior to the December 13-14 Federal Court hearing, order it directly from me via my website. You can get either a professionally printed paperpack, or a copy in Adobe PDF format. For the paperback version, I send them out nightly, and if you get your order in soon, you should be able to have it prior to the hearing. If you order the Ebook format, it will be emailed to you within a few hours. Legal arguments from the Marc Lemire case before the Federal Court of Canada. Marc Lemire is the only Canadian in history to ever beat the Canadian Human Rights Commission and in Sept 2009 won his case when Section 13 of the Canadian Human Rights Act (Canada's shameful censorship legislation) was found to be unconstitutional. This booklet covers the December 2011 appeal by the fanatical censors at the CHRC to the Federal Court of Canada.